Now no one has to know you’re wearing a medical alert bracelet unless they press the ALERT button. Medical ALERT Bracelet disguised as a normal looking sports wrist watch. | Medical ALERT Bracelet also available in color Black. Looking for a discreet medical alert bracelet? Do you have an ongoing medical condition or food allergy? Simple to Use: This Medical ALERT Bracelet looks like a regular digital wrist watch and works like a medical ID bracelet (no need for engraving, a computer, internet etc). It will speak for you in an emergency when you are unable to speak for yourself. FREE SHIPPING (Standard), One (1) Year Warranty and 30-Day Money Back Guarantee. FREE Gift. Award winning customer service. This item was shown by Dr Oz on Good Morning America. 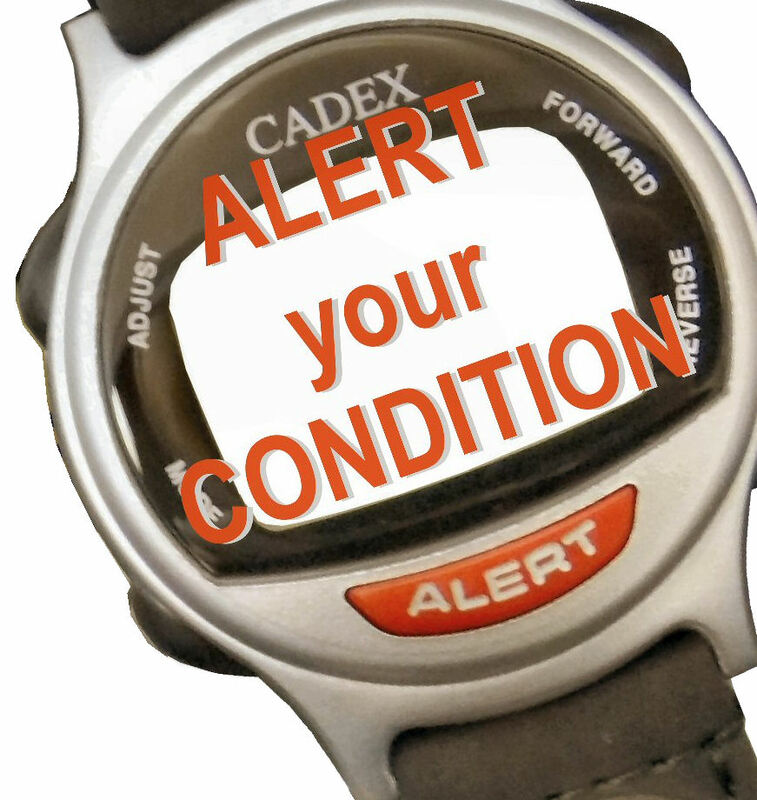 In an emergency if you are unable to speak for yourself, the CADEX Medical ALERT Bracelet will convey your medical condition / special needs to emergency responders. Critical medical information is relayed to emergency responders immediately, without connecting to a computer or Internet. Protect yourself from medical errors during hospital admission or discharge. The CADEX Medical ALERT bracelet can list critical medical information about you. Only $99.95 (FREE Standard Shipping) and No Fees. If you’re looking for a discreet medical alert bracelet, the CADEX Medical ALERT Bracelet is the right choice for you. Wearing the CADEX Medical ALERT bracelet can be critical to ensure fast and effective treatment in an emergency situation. The CADEX Medical ALERT bracelet provides a written description of your medical condition and contact information to emergency responders. Do not wear in shower or swimming pool. No computer needed: Input critical personal medical information and setup to 12 daily alarms without the use of a computer. One unique factor that differentiates the CADEX Medical ALERT Bracelet from all other medical ID bracelets is that it can also remind you when to take your medications up to 12 times per day with text message; ASPIRIN, COUMADIN, EAT SNACK etc (up to 36 letters per alarm). A high quality medical ID bracelet that eliminates the need for engraving, allows for easy update of your information and is designed to withstand the demands of everyday use. Simply write valuable information on the bracelet such as a name, phone number, and medical information. Easy to use and comfortable! Kids and young adults love this medical bracelet! What is the advantage of a CADEX Medical ALERT Bracelet? Simply write valuable information on the bracelet such as a name, phone number, and medical information. High quality medical ID alert bracelet. Eliminates the need for engraving and allows you to update without any delay. Constructed of impact resistant plastic with a soft nylon watch strap. Size is suitable for Children, Young Adults, Men and Women. Packaged in a metal box, great for storing the medical alert bracelet watch.